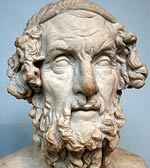 Homer (c. 850 BC) Classical Greek poet. Author of the Iliad and the Odyssey. Through his epic poems, Homer has played a hugely influential role in Western Literature. His classics of the Iliad and the Odyssey, stand at the forefront of the Western Canon of literature. Details about the life of Homer are scarce and different sources quote different variations about his life. The historian Herodotus places Homer as living around 850BC. However, other sources suggest Homer was born around the time of the Trojan war in the early 12 Century BC. The name Homer has been interpreted as meaning ‘he who accompanies, he who is forced to follow.’ or in some dialects ‘blind’. This has led to the opinion that Homer may have been blind. Homer is said to have been born on the Greek island of Chios or perhaps Ionia. Homer was likely to have been a fairly aristocratic member of court – perhaps working as a court minstrel or storyteller. Despite the length of the Iliad and the Odyssey, it is likely that at least part of these epics was initially memorised orally. In antiquity, there was a strong tradition of poems being memorised by professional storytellers. The two epics are amongst the earliest works to be written down and saved for posterity. At the time of the 8th Century BC, the Greek alphabet was just being introduced and writing was a new skill that many didn’t possess. There is debate about whether the person ‘Homer’ wrote both epics. Some argue that the works may have been produced by various people with the name ‘Homer’ added for convenience. However, other academics do maintain that both epics were written by the one person – Homer. Homer is credited with a range of poems, including the entire Epic Cycle and the Homeric Hymns. However, it is for his heroic epics – the Iliad and the Odyssey, written in hexameter verse that he is best remembered. The Iliad depicts the siege of Ilion or Troy during the last year of the Trojan War. 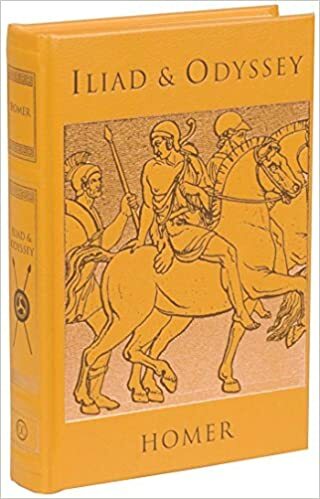 The Iliad describes how eventually the city of Troy was captured after the cunning use of the ‘Trojan Horse’ – a gift from the Greeks to Troy, which actually contained a detachment of soldiers – who once brought through the impregnable gates sacked the city. The Iliad places great emphasis on the intervention of the Gods. At times it appears, the men are instruments of fate and the decrees of the Higher Powers. In the Iliad, religious devotion and moral conduct play a key role. The Odyssey concerns the travels the Greek character Odysseus and his family on his journey back from the Trojan war. As well as Odysseus’ eventful travels back home. It also deals with how Odysseus’ wife Penelope has to deal with suitors seeking to marry her in Odysseus’ absence. The Odyssey was ground-breaking for placing equal emphasis on the role of women and civilians as on warriors. The Iliad and to a lesser extent the Odyssey have received prolonged acclaim for their unique and powerfully written style. In particular, Homer is praised for his simplicity, directness and nobleness. 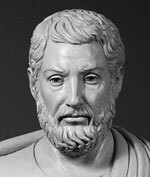 Another key feature of Homer’s epics is that he is primarily concerned with the individual human drama and emotion. He isn’t concerned with the political and religious ideologies of his time. For this, Homer’s work is often referred to as ‘dramas’. Citation: Pettinger, Tejvan. “Biography of Homer”, Oxford, UK. www.biographyonline.net, Published 09/02/2014. Last updated 18 February 2018.